Few would deny that Swarthmore’s student body, as a whole, is committed to social justice, and that the College is increasingly accommodating social justice perspectives. There are prominent student movements like Mountain Justice (MJ) that lobby for institutional change. The college has created positions like Diversity Peer Advisors in the student body and Associate Dean of Diversity, Inclusion, and Community Development in the administration to support such issues. We have departments, from Sociology and Black Studies to Political Science and History that orient curricula in varying degrees towards social justice perspectives. I find it unlikely that a student could graduate Swarthmore without having been exposed, in some shape or another, to the ideas of social justice, whether that is walking through an MJ protest in Parrish or overhearing a discussion in Sharples about contentious political and social topics. But that is not what Zipp and other organizers mean here. They mean (in a fairly Orwellian way) that there are some students who have not accepted these ideas yet, and it is those students who, coming from an “ignorant” position, must be re-educated to share these values. Before I continue further, I want to make one point clear – this requirement is still in the planning stages, and so I don’t know exactly what it would look like. If it takes the form of a “diversity” requirement or a “global citizenship” requirement that can be fulfilled by taking a class on Chinese tea culture, learning Japanese, or a class on world religions, I have no problem with that. Such a course would be teaching students about other cultures rather than explicitly teaching strongly disputed ideologies. However, I suspect this is not what the organizers have in mind. Rather, the requirement “can be considered as a counterbalance to the “neoliberal impact on the liberal arts,” as Professor Sa’ed Atshan ‘06 noted.” If this is the sort of requirement the organizers have in mind, then I oppose it for two major reasons. First, I believe the purpose of a college course is not to teach an ideology but rather to critically engage with the material and with the world. I am not saying that a class on race in America does not involve critical engagement with America; on the contrary, I am sure that classes on social justice have a lot to critique on the state of America. Nor am I saying that it is truly possible to avoid teaching in an absolutely non-ideological way; all curricula inevitably have some ideology to them. However, I fear that social justice classes would inevitably teach the perspective that the social justice ideology is objectively correct and that other viewpoints are incorrect because of the lack of viewpoint diversity in the curriculum and the ideological bent of the professor in such a class. I have seen in classes that when disputing viewpoints are introduced from conservatives or moderates, they are brought up in order to be dismissed as problematic and torn down. As a result, the goal of such classes is to teach students that white America systematically perpetrates racism against black America today, and that institutions such as capitalism and the patriarchy are forces that need to be destroyed – points that are, of course, highly disputed in the world today and yet might be taught as objectively accurate in these classes. My concern with a social justice requirement is not that it teaches social justice in and of itself. For example, although I believe free markets have been helpful in alleviating global poverty (for the most part), I would not want to require students to take a class to teach them that the free market is amazing because there are important critiques of free market capitalism that should be discussed in any class on the issue. But that is not what Zipp and other organizers mean here. They mean (in a fairly Orwellian way) that there are some students who have not accepted these ideas yet, and it is those students who, coming from an “ignorant” position, must be re-educated to share these values. My purpose here is not to dispute social justice as an aim or perspective; I agree with some of the perspectives of social justice activism and disagree with others. What I do take issue with is that I do not believe these courses would provide a fair and balanced curriculum that allow students to decide where they stand on these issues. Rather, the goal of the curriculum would be to teach a certain perspective. This is the difference between saying “I want to teach a class on race in America” and “I want to teach a class that shows how white people still perpetrate racism against black people”. In the former, one certainly should provide readings that support elements of critical race theory and other similar theories, but one should also provide readings that compellingly and legitimately push back on the notion that racism is embedded in institutions in America. It may very well be the case that the evidence for the latter argument is weaker than for the former, but I believe that such a course must make the best possible case for all sides and let students decide for themselves which perspective they find more compelling. Additionally, an ideologically biased curriculum may make dissenting students feel as if they cannot voice their perspectives, as they may fear that their grades would suffer by dissenting from some of the premises of the course. I do not know whether they would actually be discriminated against or not, but the perception of discrimination would be enough to stifle conversation. Whether it is religiously-minded students supporting traditional values relating to gender identity and sexual orientation or radically-minded students who favor abolishing marriage and other traditional norms altogether, I think that encouraging discourse on these issues helps everyone in the class develop their own perspectives further and critically engage with opposing viewpoints. Second, I think it is counter-productive to force students to take a class on social justice. Forcing students to take a class teaching something opposite to what they believe would make it even more likely that they would oppose the tenets of social justice, and conversations would inevitably not be productive. For those who are curious about social justice – and I think many incoming students are curious – the requirement may help. But in all honesty, discussions of social justice are prominent enough at Swarthmore that their curiosity would lead them to take the class anyway if they so desired. I do think it is possible to teach a class on the critical issues facing American society and the world today in a fair way that incorporates social justice perspectives. Right now, I am taking a Political Science seminar entitled “The Urban Underclass and Public Policy” in which we discuss the institutionally racist policies of the past century that have led to urban and minority poverty in America today. However, we also read conservative authors like Charles Murray who argue that welfare policies disincentivize work, and he controversially concludes that the welfare state should be entirely eliminated. Importantly, we treated Murray with the same respect and critical perspective as we did other authors in the class, not merely as a piñata to bash. Whether one agrees or disagrees with his conclusions (and the class unanimously disagreed), multiple students came away from that week saying that it was valuable to read a dissenting perspective on the efficacy of welfare programs. Although his work was flawed, I know that it taught me some valuable lessons about welfare policy in America. However, from what I have heard from friends who have taken other classes on race, gender, identity, and globalism at Swarthmore, the curricula are not nearly as diverse or balanced, and as a result I fear that my seminar would be the exception rather than the rule. Any additional requirement should have the goal of teaching students to be more aware of the world around them. Part of understanding how the world truly works is acknowledging that humanity is complex and that no one single ideological framework can allow us to adequately understand human behavior. While social justice is a useful framework for understanding history and contemporary society, there are legitimate critiques of social justice that would enhance the education of Swarthmore students. Unless such perspectives are incorporated into the curricula of these potential social justice classes like they are in my Political Science seminar, I cannot support such a requirement. 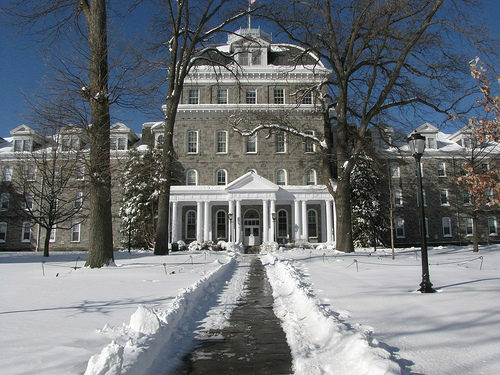 If I were a high school student looking to apply to college today, I can’t help but feel that in looking for a school that taught me how to think versus what to think, I wouldn’t evaluate Swarthmore highly. Which is a shame, because I believe that Swarthmore is one of the most academically rigorous schools in the country, and I hope that we do not compromise our identity as an institution of critical engagement and free thought with such a requirement. Featured image courtesy of www.bloomberg.com. While I don’t agree with all of the article, I definitely agree that it’s largely an ideological requirement. I think it’s very elitist of the school or students that are planning this to assume people are too ignorant during their time at Swarthmore to be unaware of social justice issues and be forced to take classes. I think the implication that the student body needs to be ‘educated’ about this is very condescending. It’s exhausting that often times humanities courses here turn into echo chambers of who can be the most liberal student. It ignores the fact that a grounded position on policy, history or social justice requires an understanding of the spectrum within moderate positions as well. I would hope that if this is being seriously considered that the entire student body is consulted. Furthermore, I think the last thing people need are more cumbersome requirements to finish for graduation. Alumn said : “Our university’s reputation repels most, but not all, conservatively inclined students. Let’s make sure we keep all of them out by creating a social justice requirement.” This is a dangerous attitude, and shows that there is a real issue here. There may be some attitudes that mean a prospective student should be barred (even that is controversial – one might think basic principles of justice mean it should be actions, not beliefs that would be the key this here) – but political leanings surely do not form part of this set. It is precisely the conservatively inclined students who might learn most. And of course the liberals might also learn from the conservatives – no to agree necessarily, but to better understand (and possibly be better able to combat, should they choose, as I would hope they do). I don’t know who funds Swathmore. It if it public money, then this seems a basic democratic principle to me. Certainly, a lot of classes are ideologically biased/informed at Swarthmore (I don’t think there’s a such thing as being *fully* outside of a ideology or worldview), but generally speaking, Swarthmore doesn’t force students to take classes *because* they are in line with a specific ideology. I’ve taken courses at Swarthmore that would probably qualify for a SJ requirement. I’ve enjoyed some of them, disliked others. The arguments made in those classes have definitely expanded my view of the world, whether or not I agree with them. I don’t object to the existence of such classes. I do object to the college declaring that all students *must* learn under the tutelage of professors of a certain ideology. Swarthmore is ideologically homogenous enough as it is. If “this requirement is still in the planning stages, and so [you] don’t know exactly what it would look like,” how did you manage to come up with 1,500 words critiquing the class(es) that would fulfill this requirement? My suspicion is that you came up with a fantasy of what these curricula would look like because you’ve totally bought into the sensationalist “critiques” of social justice principles promoted by the likes of Jonathan Chait. Maybe you’re the one who should consider some alternative viewpoints. I think that this article comes across as a bit reactionary. I think that the diversity requirement is a way to engage students in controversial issues and to inform them about such issues as identity, gender, class, etc. In other words, I don’t think the diversity requirement would instruct students on how to think about X issue, but to introduce them to why the issue is important to a certain population and why there is disagreement in the ways we address said issue. I don’t see why a diversity course wouldn’t be up in a way that is similar to other classes that equally weigh both sides of an argument. I don’t think I understand your reasoning about how a diversity course would be different then say, your Urban Underclass course in the way that it would present its material. He chose to take that course. This endeavor on the otherhand requires taking a social justice class. I find it highly unlikely that at Swarthmore these courses would present conservative, or even moderate perspectives in any way other then derogatorily (if at all) especially if they’re related to race class and identity. If students refuse to allow a conservative alums like Robert Zoellick to speak on campus, but openly and unhesitatingly embrace Noam Chomsky, an absolutely radical leftist who despises his own country and hates Israel, I fear for the integrity of this proposed course requirement. Thank you! You’re exactly right. I’m surprised you read Charles Murray because I’ve never had a class that balanced at Swarthmore (I’m a Humanities major).